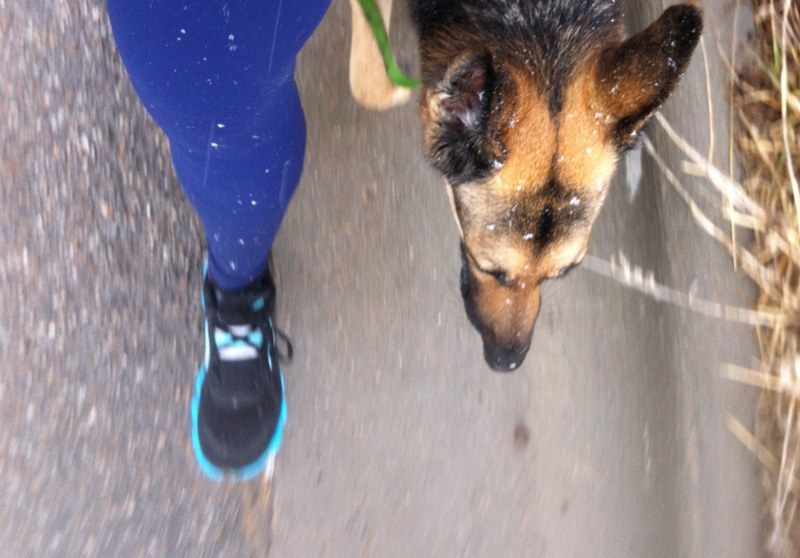 We ran for Boston today – a run at lunch with a friend and a run tonight with the local running store. Runners throughout the world are adding up the miles dedicated to those affected by the tragedy. In a way, this is our prayer. We run for those who can’t, we run to show support, we run because it feels right. And as we run, we meditate on lives lost, but more importantly on the amazing show of humanity and love in the outpouring of support that has surrounded and lifted up those affected in Boston. We will continue to run and we will be strong. 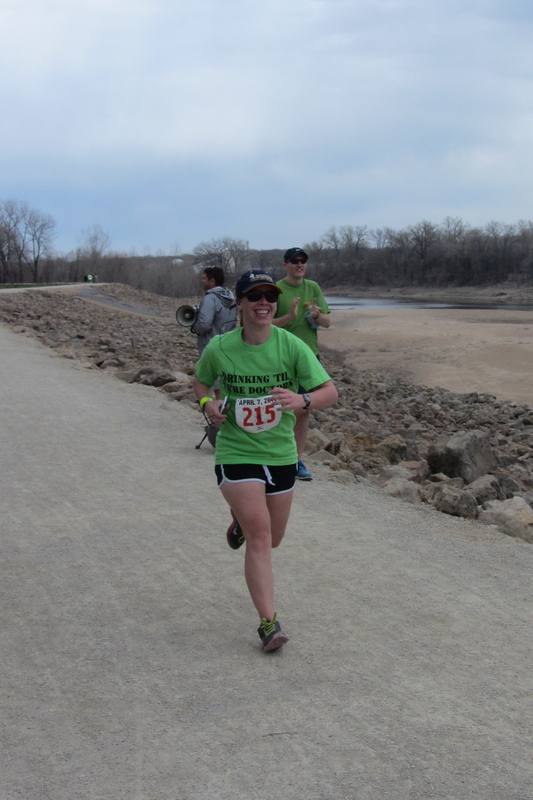 This Sunday is the Kansas Half Marathon, and with everything that has happened, it will have a little bit different meaning for every runner who is there. I will be wearing the Runners United to Remember bib as I attempt to reach a new PR. I am still working toward breaking that 2:00:00 barrier, so I am aiming to get closer with this race. 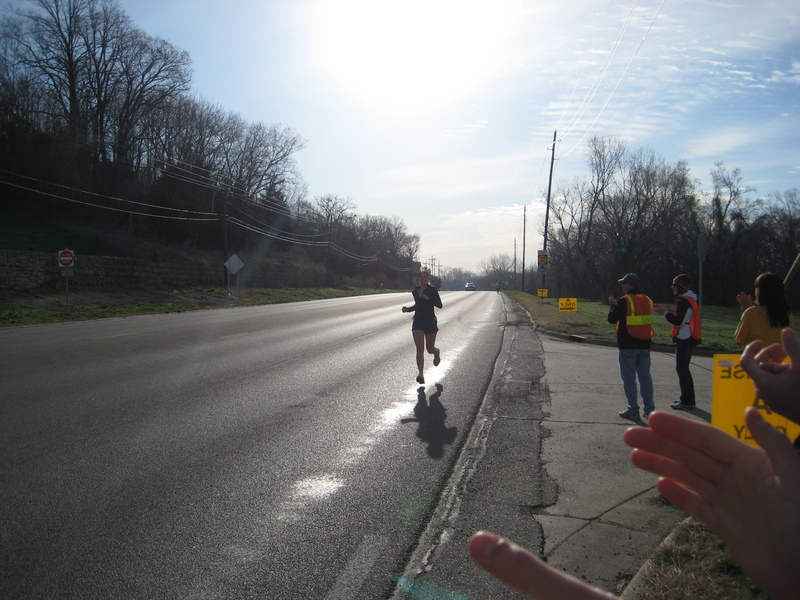 My previous PR of 2:16:43 was at the Kansas City Half in October. Despite being a PR, it was not my best race, and I believe I can greatly improve on the time. My hope is to finish close to 2:05 and my plan to achieve that is to start running with the 2:10 pace group to warm-up and then increase speed after mile 6 of the race to attempt to catch the 2:05 group. My goal time is 2:06 (10 minutes faster than my PR) and my stretch goal is anything faster than 2:05. I would be ecstatic if I managed to break 2:00, but I’ve never yet managed to sustain the pace required for that amount of time, so not sure I’m there yet. My plan is to have everything laid out and ready to go Saturday night, so I don’t need to think about anything at the crack of dawn Sunday in time to leave the house by 4:50am to leave town by 5:00am. That will put us at the race start around 6:15am to pick-up our packets and have a nice cushion of time before race start at 7:30am. 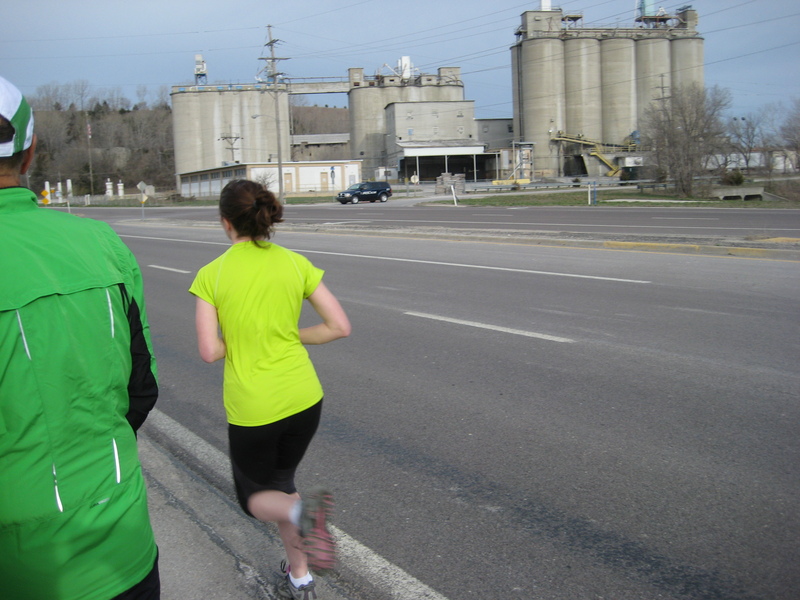 The rest of this week’s training will be focused on tapering for the race on Sunday. My plan is to run an easy ~5 miles tomorrow afternoon, do a short but fast 2 miles on Thursday, full rest on Friday, and an easy 1-2 miles on Saturday to loosen up my legs. I’m also hoping to do a little yoga tomorrow or on Thursday. I’ve opted to skip the weights this week to avoid any unnecessary soreness on Sunday. My other major goal for this week is to get enough sleep. I’m off to a bad start, but my goal is to be in bed by 10pm the rest of the nights this week. I’m sure I’m forgetting something, so I may update this post as I think of other aspects of the race that I need to worry about. Do you have any races planned? Do you write a race plan ahead of time? My heart is in Boston today, and all my thoughts and prayers are with the victims of this senseless attack. I have no wise words, no deep insights today. Please just join me in thinking and praying for Boston. If you have a race coming up, consider joining the “Runners United to Remember” event and wearing the remembrance bib. This is not a fundraiser, it’s just a simple act to show support and solidarity with the runners, volunteers, spectators and locals affected in Boston today. reach the heavens own blue. 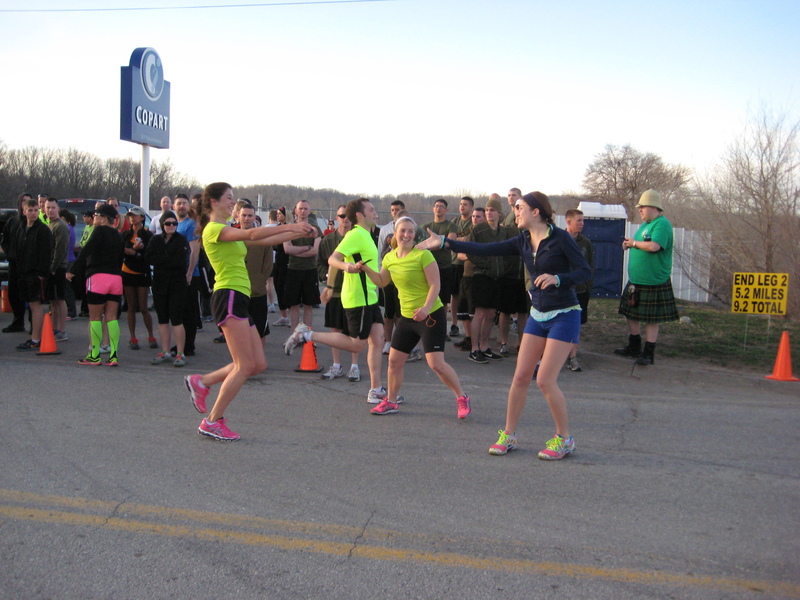 To see part one of the Brew to Brew race report, visit here. After the first exchange point, we all piled into vehicles and headed toward the second exchange. We did have some trouble finding a few of the exchange points early in the day, but they got easier and more obvious as the day progressed. We lost the other vehicles on the way to the second exchange point, so we spent a little time texting and calling to try and get them to the right place. Despite the lost time, we had a little bit of time to kill even after everyone else found the exchange point. 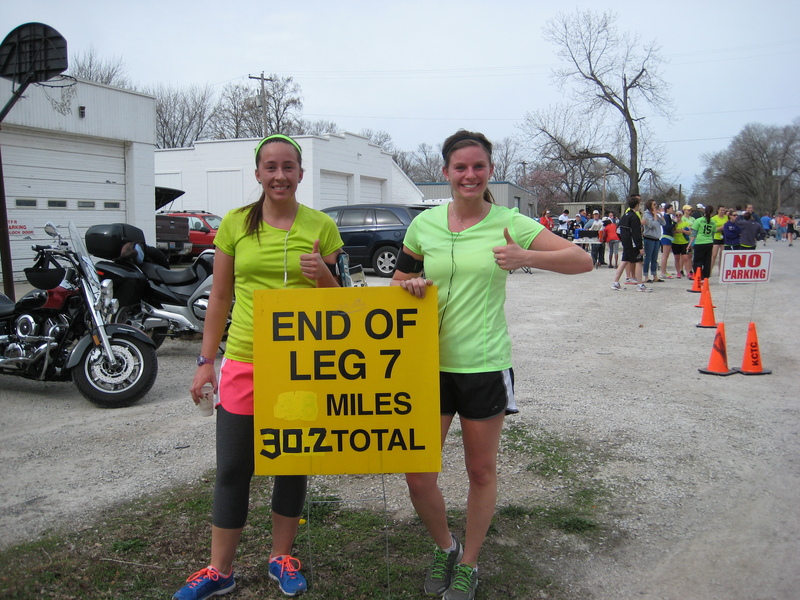 Leg 2 was 5.3 miles, so we were expecting our runners to finish in about 40 minutes. We sat in the car for a bit to stay warm, and about 7:25 am we got out to cheer for other teams while we were watching for our runners. Before long, we spotted green shirts in the distance. They were together and approaching at a breakneck pace! We cheered them in as our next runners got ready to take on legs 3 and 4. Double exchange 2 complete! This photo looks posed and perfect, but I swear it was real! The leg 2 runners absolutely rocked their leg and it took them a little while to recover before we could snap a photo of them. We had plenty of time to get to the next exchange point, so we hung out for a bit and dug into those muffins I had made. I was going to be running next, so I was a little hesitant to eat a muffin. I decided to just risk it since I was hungry and still had at least an hour before my leg. I think in the future I will need to do a better job of preparing nutrition to run non-consecutive legs, but I hadn’t put much thought into it this time around. After we finished eating, we decided to go out to the next exchange point to cheer our runners even though they were running through to finish two legs. 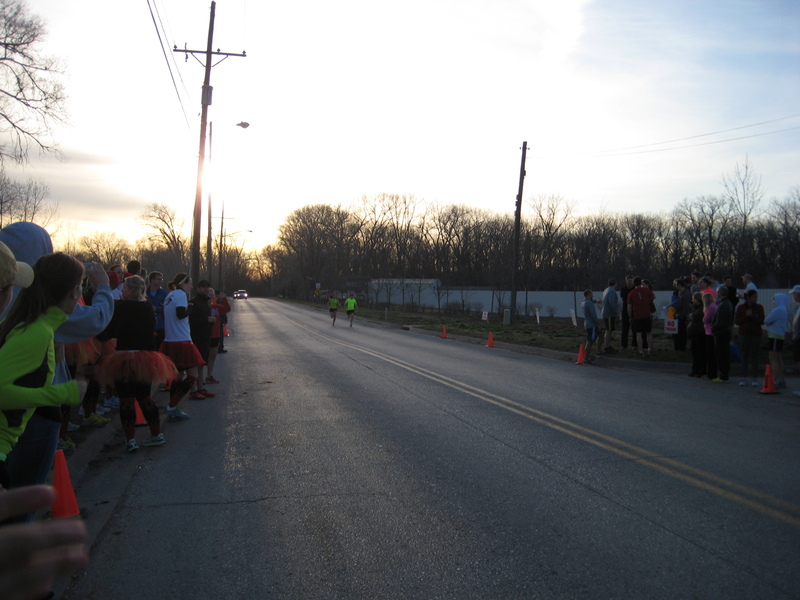 We parked and walked up to the road to cheer for the other teams till we saw our runners coming through. They had just a little over 2 miles to go at this point to complete leg 4, so we hit the road quickly after cheering for them and headed to exchange point 4. I was running leg 5, so I started getting ready to run in the car on the way. I got my fuel belt adjusted and shed my outer layer to just wear shorts and a t-shirt for my run. When we got to the exchange point, we made a quick port-a-potty stop and headed down to the course. Before long, our first runner was approaching. The two runners on this leg had gotten split up, but I knew the second runner who I was relieving would not be far behind. Leg 4 completed and leg 5 begun for team 2! A few minutes later, and I started leg 5 for team 1! I knew I had to run about 4.7 miles, and I wanted to catch up as much as possible to the other team’s runner to get the teams back in sync, so I started at about a 9:00 min/mile pace. Initially, I had planned to run this leg quite a bit slower, but I felt great so I just went with it. My legs never got tired during my run, and the course was fun, flat and fast, so I felt like I was cruising. I passed a few runners, and thought I caught a glimpse of our other runner at one point, but I wasn’t able to catch her. 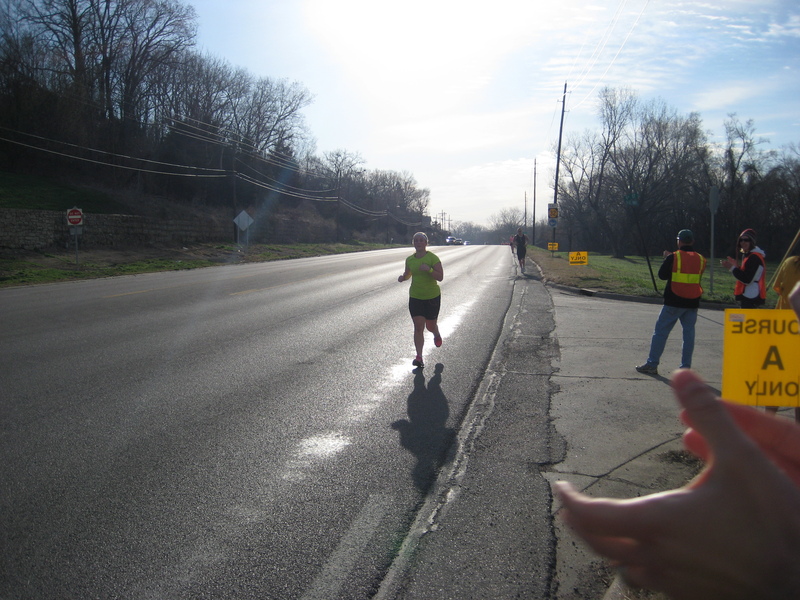 She finished her leg and handed off for leg 6 to begin. I finished my leg in just about 42 minutes, which was just under 9 minute miles. I handed off the slap bracelet to my hubby and he took off for a hard 3.3 mile uphill run. We regrouped at the station, and took a photo to commemorate the end of the leg before driving to the next exchange. 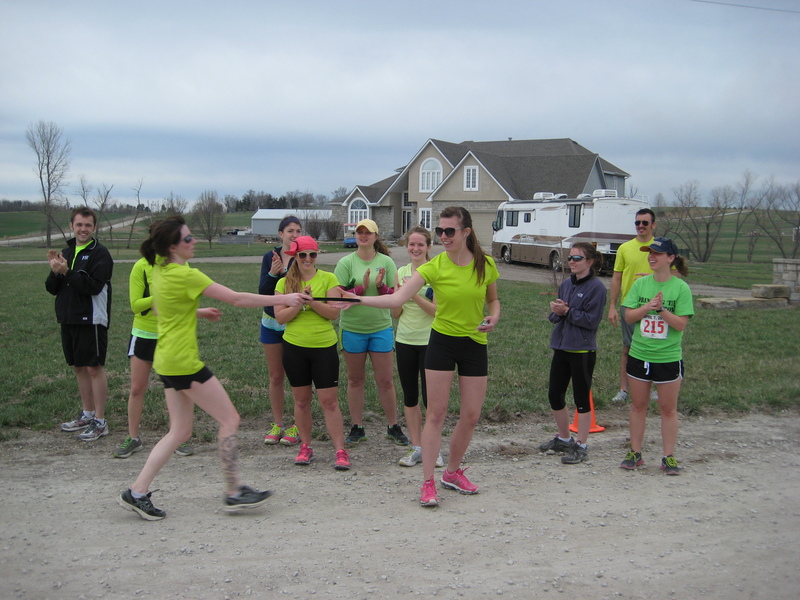 At this point, the two teams had to diverge a bit as the race coordinators split up teams into exchange points A and B at a few different places along the course to reduce the congestion at the exchange points. For our early start, it wasn’t really needed as there were few teams running that early, but I expect it’s really helpful for the volunteers to keep things moving smoothly as the day gets busier. We drove to exchange point A to start leg 7. 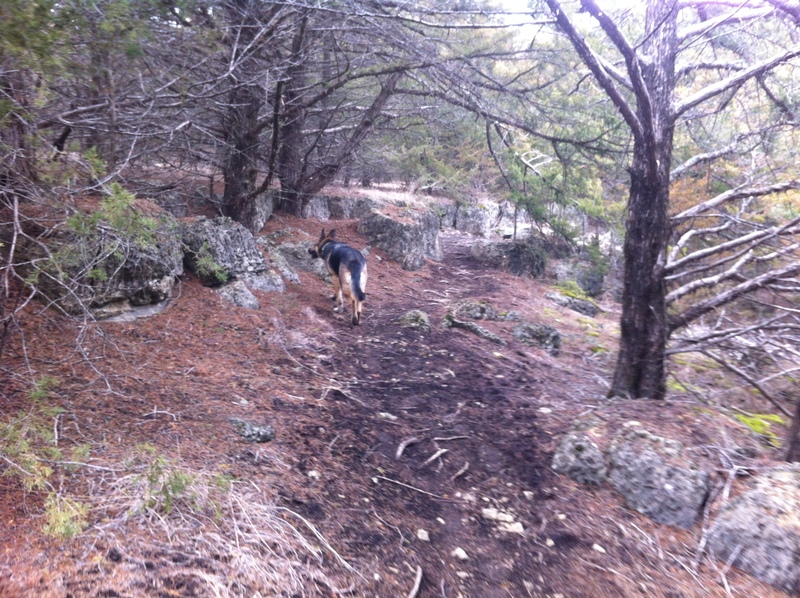 Curtis killed his hilly leg and ran those hills like a champ. 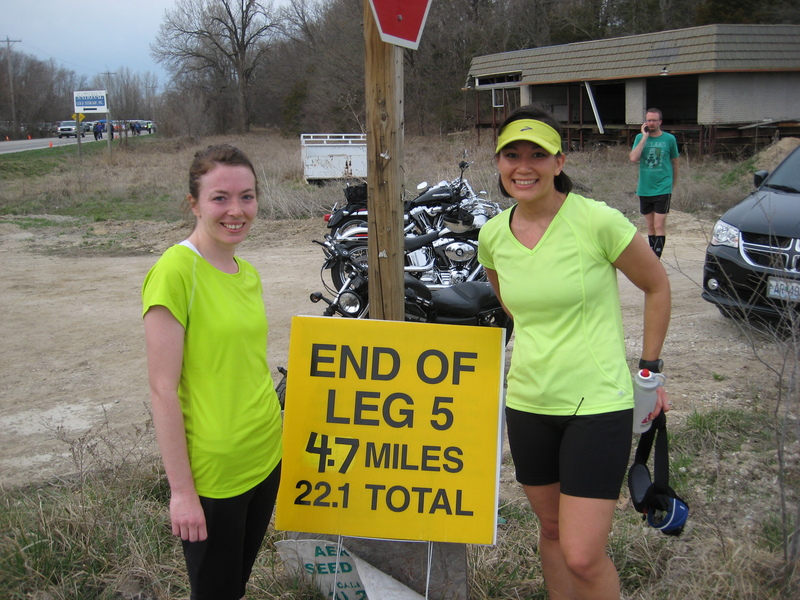 We were finished with more than half of our total miles, with just four legs left to run. We met up with the other team again at the next exchange point. It was in a small Kansas town and there were delicious grilling smells wafting around, making us all very hungry! I decided it was time for some more food as I’d be running again at leg 9, but I had to pass on the burgers. 😦 I settled for some banana and a Power Bar. Leg 7 is interesting because the runners have the option to either run an extra mile or take a short boat ride across a creek. It sounds like the vast majority of runners take the boat, and our runners commented that they didn’t see an option to go by the road. The actual mileage for the A course and the B course are drastically different, so this is something to remember and be aware of next year, as my notes did not have this info when I was putting together the teams. 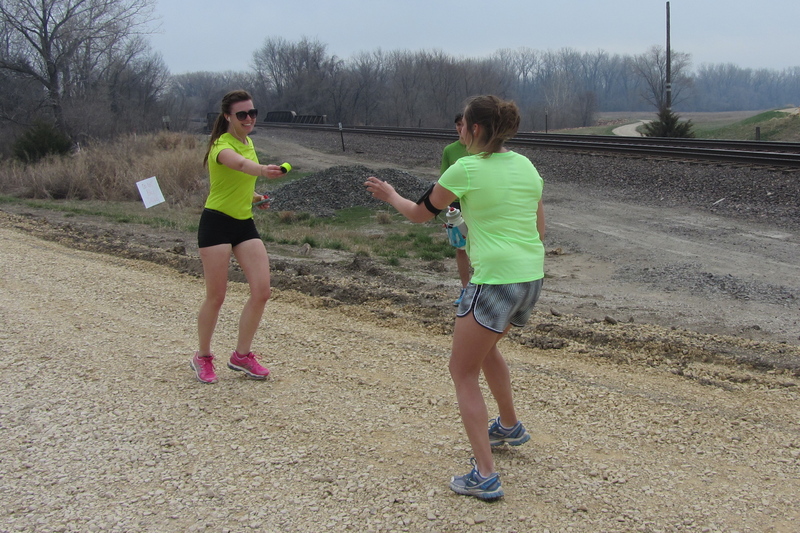 The leg 7 runners came in very close to each other, so the teams were getting back into sync again. After leg 7, it was time for me to get ready to run again. I strapped my fuel belt back on and stripped my long-sleeved shirt to get ready. The last few legs are all on gravel/dirt roads through small farms. Our teams congregated at the exchange to wait for our runners. We didn’t have long to wait before it was time to take off for leg 9! I felt ok as I started my leg, but it didn’t take long before I felt the 5K from the day before plus the earlier leg that day catching up to me. Leg 9 is on a rolling gravel road. My shoes were slipping on the gravel quite a lot, and I was tired by this time in the day. I think that I could have done a better job of fueling to help get me through this leg. I finished the 4.2ish miles in 10 minute miles, so quite a bit slower than my earlier leg, but it was about all I could push myself to do. The very end of the leg has a bit of a “fake out” exchange station where you have to keep running about .25 miles after you see the first vehicles to get to the actual exchange. I tried to pick it up as I ran down the hill to meet my team. Leg 10 began and we were on our home run! 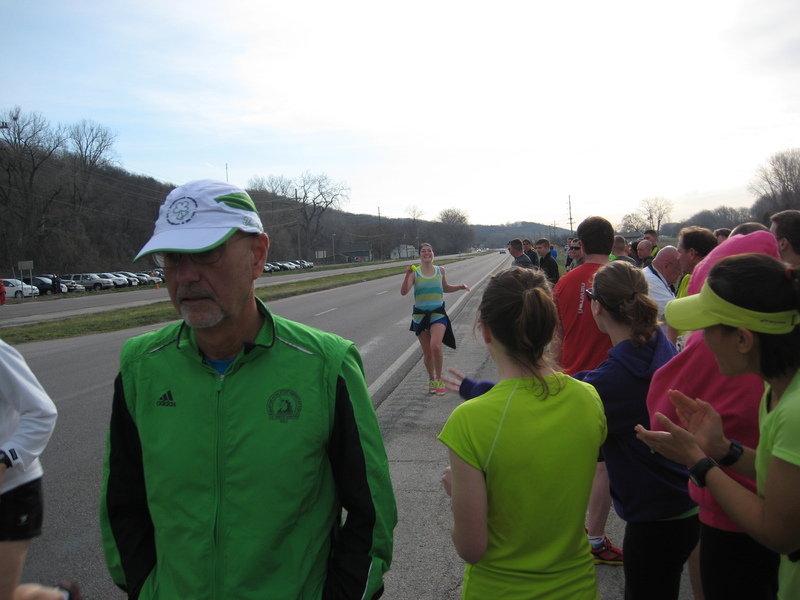 We left the last exchange point and headed to the finish line in Lawrence, KS to cheer for our final runners. We almost didn’t make it in time to see team 1 finish the leg. Luckily, we were at the finish line just in time. 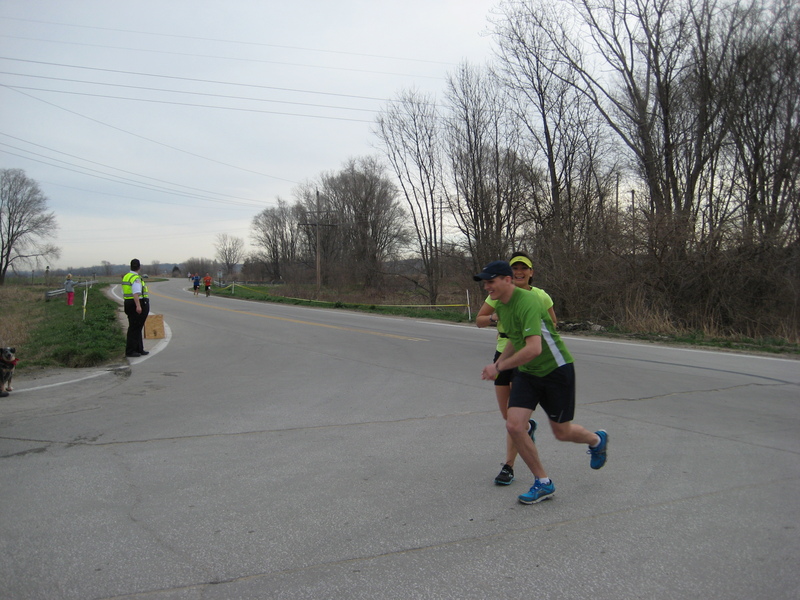 Our leg 10 runner finished strong to bring team 1 into the finish in 6:44:07, which averages just about 9:10 minutes/mile. 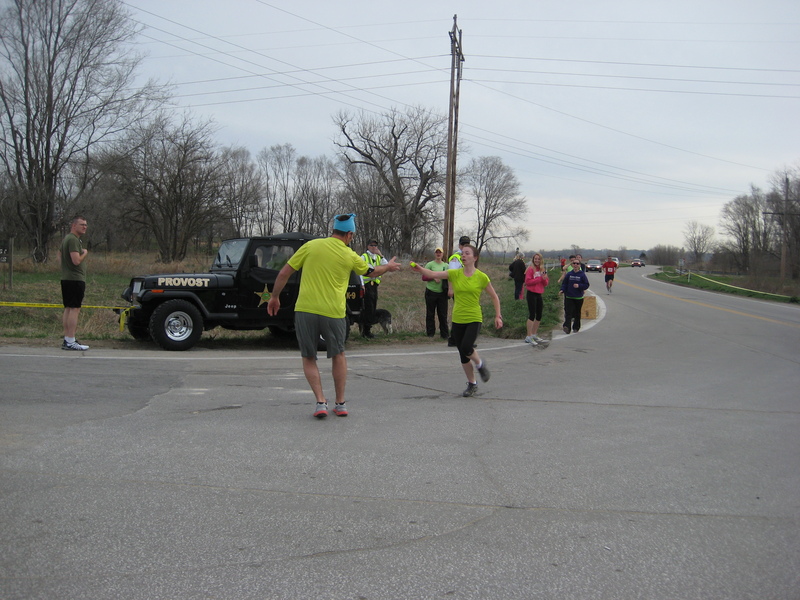 Curtis and another of our teammates walked out to meet our final runner from team 2 and run her into the finish line. It was another strong finish for a total time of 6:58:40 (9:30 min/mile pace) for team 2. After a long day, we finished our 44.4 miles and went out for a well-deserved meal of burgers and beer at a local restaurant. Overall, it was a really successful day of running. Everyone did phenomenally well and I am so proud to have such awesome teammates. The course was a nice mix of terrain and the exchange points were pretty well organized. This year the weather made for a gorgeous day for running, unlike the unbearable heat from last year. I can’t wait till next year! If you ever have the chance to run on a long distance relay team, I highly recommend it. The experience was fabulous! Last weekend was hectic and packed full of fun running events. After Dog-N-Jog on Saturday, I had a little bit of downtime to prepare for the rest of the weekend. I squeezed a tiny bit of studying into the afternoon, then baked some muffins for my Brew to Brew teammates before getting ready to leave for Lawrence, KS to be closer to the start of the relay in Kansas City. 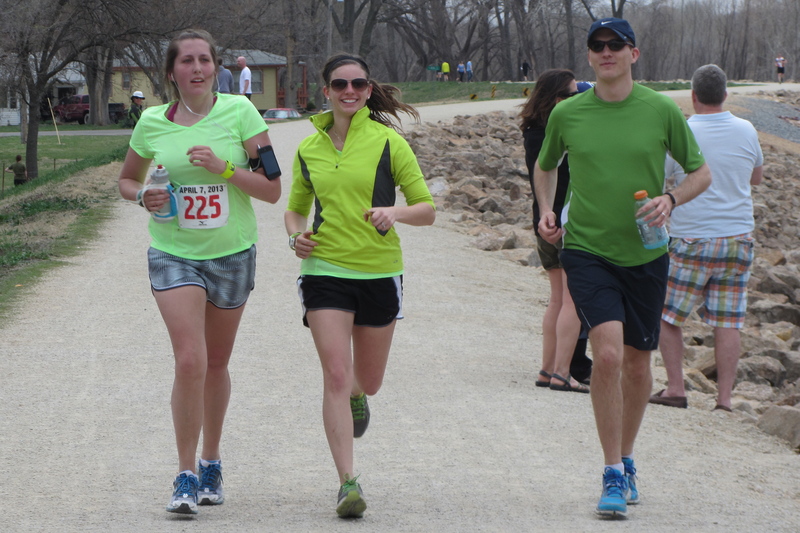 We have been planning for this race for months and ended up having two teams to run the 44.4 mile point-to-point relay from Boulevard Brewery in Kansas City, MO to Free State Brewery in Lawrence, KS. The race is 10 legs and we had 17 runners, with 8 runners on team 1 and 9 runners on team 2. Three runners ran 2 legs each to make up the difference. Organizing the runners and then the vehicle driving schedule are the most difficult part of planning for the race, but once they were figured out, everything else fell into place pretty well. Everyone traveled to Lawrence on Saturday for a pre-race pasta dinner and team meeting, where we went over our plans for Sunday’s relay race. 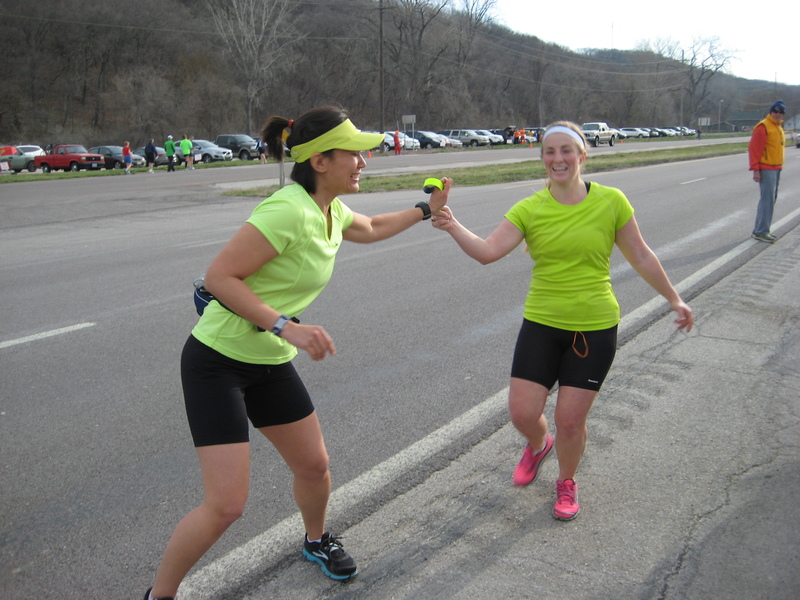 We hadn’t decided on what we would use as a baton, if anything at all, so we made a last minute decision to use some bright yellow/green reflective snap bracelets that I had as our “batons” for the relay. Our lovely chefs for the evening. After our dinner and meeting, we split up and half of us traveled to Kansas City to stay the night, several people went on a beer run, and the rest of us hung out for awhile before bed. We stayed up later than I intended, but a big part of the fun of the weekend is the camaraderie, so it was definitely worth the lost hours of sleep! 4am came really freaking early on Sunday. The crew that stayed in Lawrence needed to be out of the house by 4:45am to get to the starting line to meet our teammates at 5:30am in time to send off our first runners after a team picture. Well, best intentions, right? We were up and at ’em, but leaving a little later than intended combined with poor GPS directions, and we didn’t make it to Boulevard Brewery till just about 5:45am. Luckily, the rest of our teammates were there and we were able to take a quick picture and send our first two runners just in time to begin their legs at 6am. Last year’s race was insanely hot, so we had chosen to take the earliest start time for this year in case it happened again. It was pretty chilly at only ~45 F, which I know I was unprepared to handle. I brought about every possible combination of clothing that I would need, except I managed to forget a warm jacket. Needless to say, I shivered through the start! 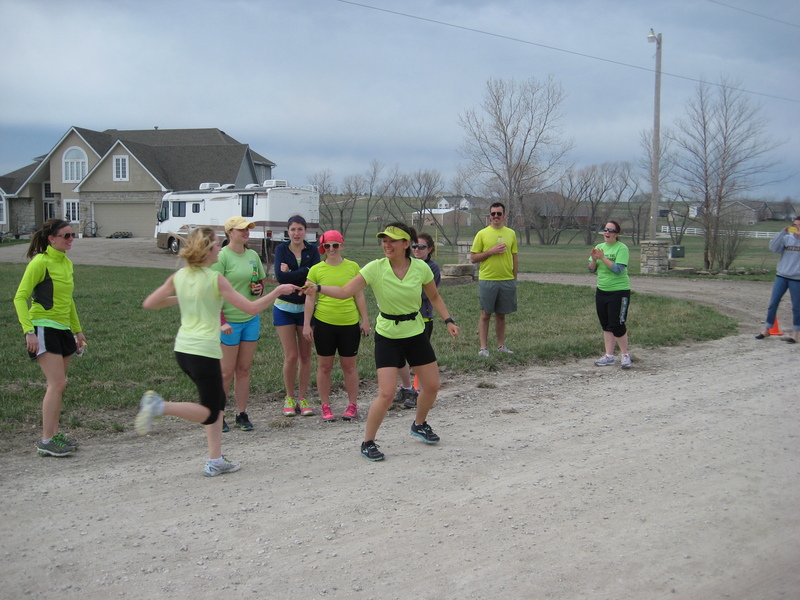 The day was slow to warm-up, so we were all bundled for most of the day, but our runners all rocked green shirts during their legs. We had decided in advance that we would wear bright neon/lime green shirts to make it easier to see each other at the exchange points. Apparently, neon green is very “in” this year because we were one of many teams with the same idea! Next year, we’ll have to get a little more creative and find another more unique color. I’d like to look into having tech t-shirts made for everyone to match if we can do it at a reasonable cost. This was the start of a very long and exciting day. Since sunrise was scheduled for close to 7am and dawn wouldn’t come till 6:30ish, so our first runners got to contend with running in the dark. 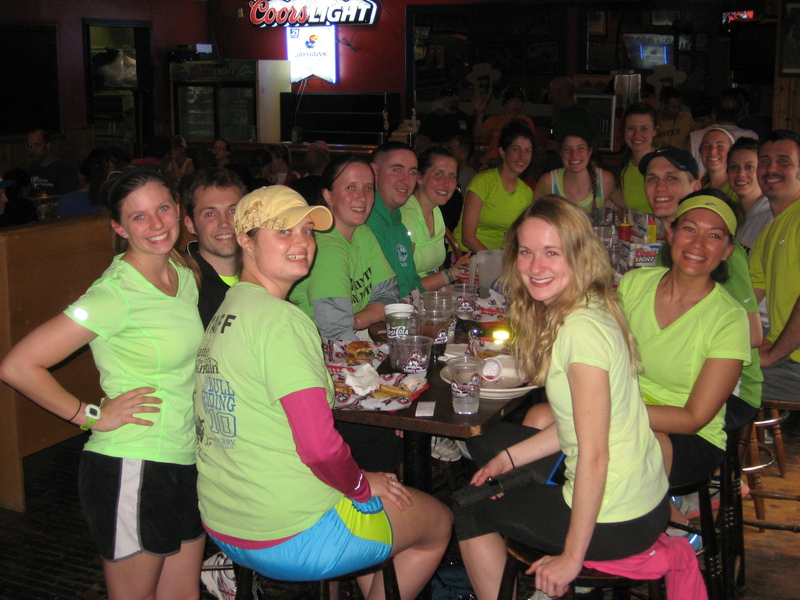 We made sure that they were decked out in reflective gear for safety, and they fit right in! Check out all that reflective gear! Our runners came in right about the time we expected them. They were very close together, so our exchanges went off one after another without a hitch. And the second part of exchange 1 complete! 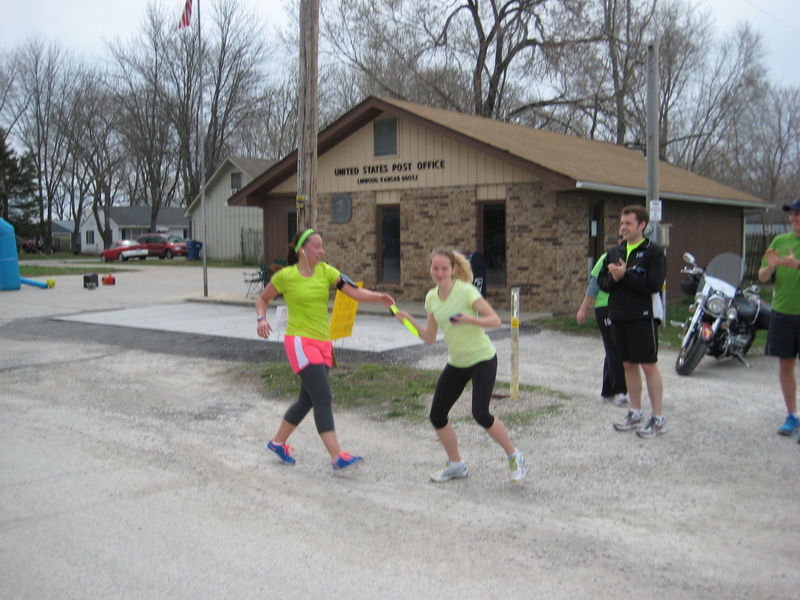 Our first two runners finished their 3.9 mile leg, getting us off to an awesome start for our day of running. End of Leg 1: 3.9 miles completed. 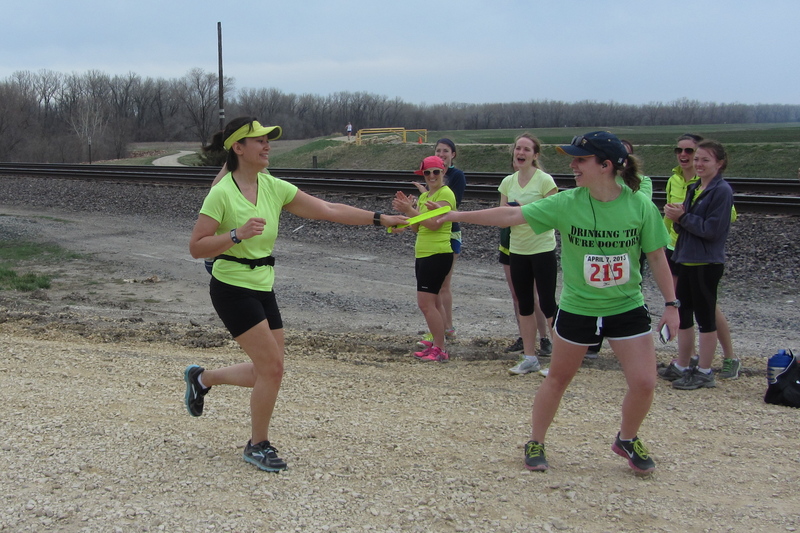 I’ll post my review of the rest of the race tomorrow, but I did want to back up a bit and write a little more about the planning that goes into relay races. The relay concept can seem confusing if you’ve never done it before, but with a little work to make sure everyone gets to the right place at the right time, the day can go really smoothly. 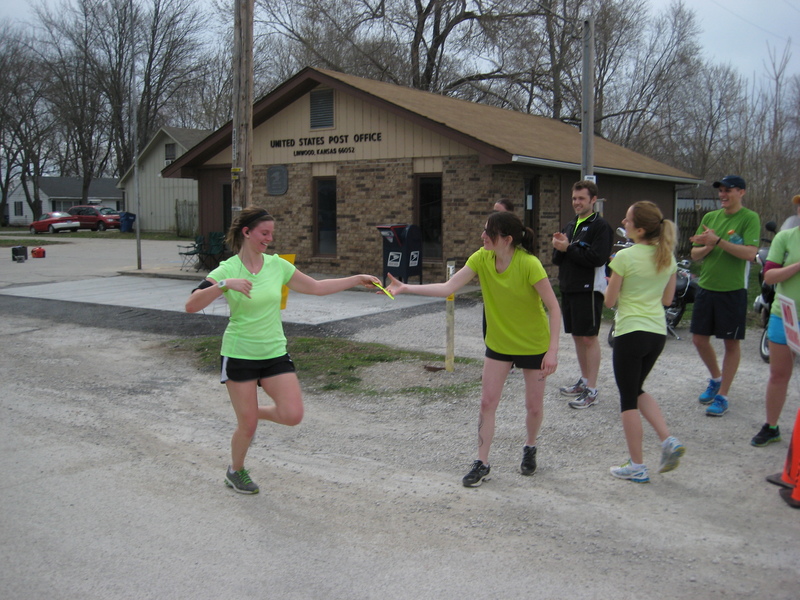 Last year, not having the experience of a relay race, I did not put too much thought into pacing for our two teams. This year, I decided it would be fun to try and match paces on the two teams so that we could spend more of the day together. This ended up working out pretty well, though there are definitely still some kinks to work out. After confirming the list of committed runners, I sit down with it and with the course details on each leg and start matching. I had a pretty good idea of each runner’s pace, and I had asked them for any preferences of leg and maximum distance they were willing to run. In the future, I think it would also be a good idea to ask for the minimum distance people would like to run so that anyone getting ready for spring races can use the race as a training run if they like. I just use a spreadsheet so I can copy & paste names into the roster and move people around pretty easily. 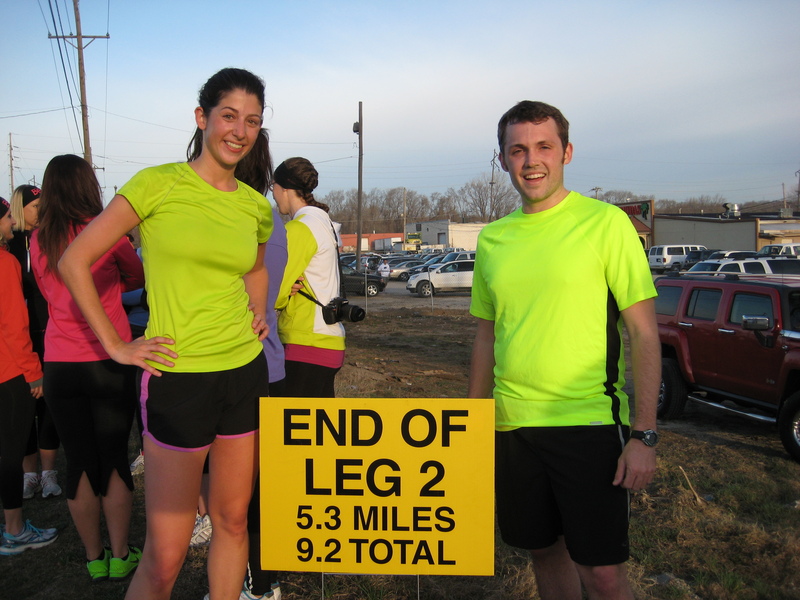 Once I had all my info, I started with the shortest legs and tried to match runners in pace who wanted to do shorter distances and I also tried to fit as many people to specifically requested legs as possible. Curtis and I were the only couple this year, but if there were other couples, I would probably try to keep them together on the same team to make vehicle coordination easier later. I leave the most flexible runners to place last, so that I can fill any gaps that don’t have a perfect match prior. This year I did a few iterations of this because we started with enough runners for 3 teams, but unfortunately, we lost several runners for various reasons. When the teams were finalized, we registered the whole team. Last year, each person registered separately and just entered the team name; this year, everyone had to be registered together at the same time, so I did the main team registrations and then had each person meet me to enter individual information. I thought it would be easier than gathering everyone’s information, but in retrospect, I think it would have been easier to have everyone complete a short form and return it to me to enter. This was all completed about a month and a half prior to race day. Closer to race day, I worked out the driving schedule for the trip from Manhattan to Kansas City and for the day of the race. For that, I start with the vehicles offered and then just fill them according to team, moving people in and out of vehicles as they finish running their legs. I assume that people will pretty much get where they need to be even if there are some changes on race day, so as long as the main concern is getting the next runner to their exchange point, pretty much everything else follows. More tomorrow on how the rest of the race went! 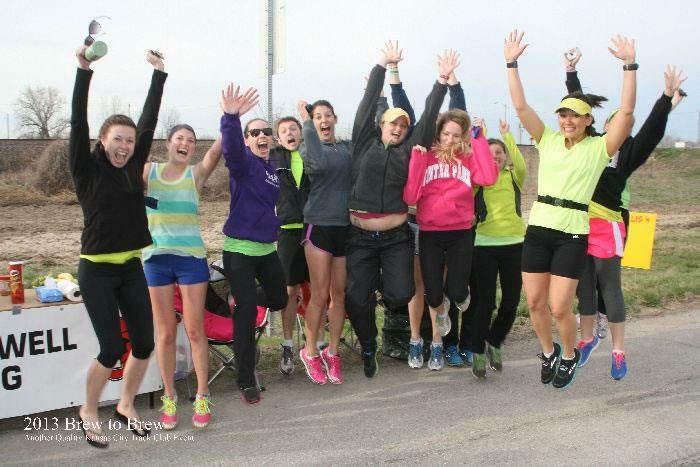 Have you ever raced a relay or organized one? 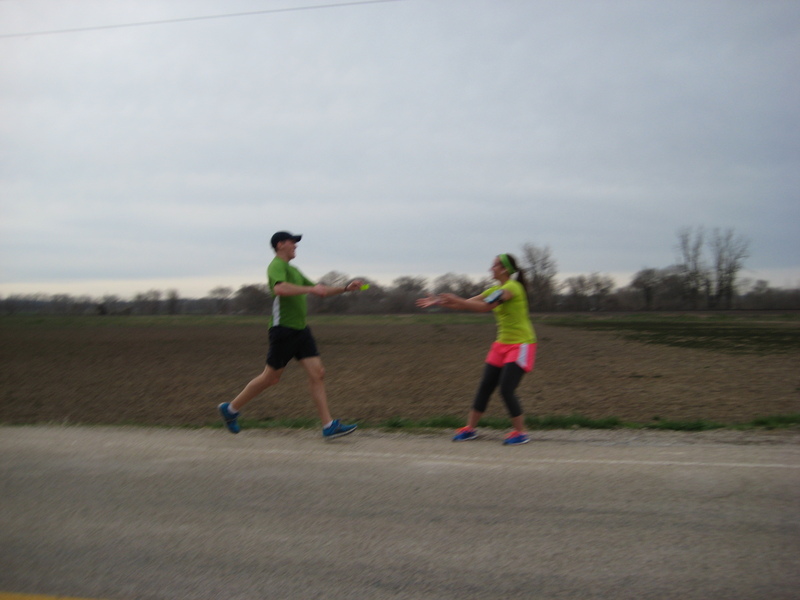 10 mile run – last one before the Kansas Half Marathon next weekend! This weekend, I have a 5K race on Saturday (Dog-N-Jog) and a relay race on Sunday, in which I’m running two legs for about 9 miles total. Both races are more “for fun” than major goals for me. I’m very tempted to go for a PR on my 5K at Dog-N-Jog, but knowing that the start will be insane with all the people and pooches, I think it is more important to just enjoy the event without setting any race specific goals. My major goal for the Brew to Brew relay race is that the day goes smoothly and everyone gets to the exchange points on time! I’ve toyed with the idea of going to the gym in the morning to lift, but I think I am going to prioritize sleep over an extra workout this week. My plan is to do a light 3 mile run around the neighborhood right after class ends in the afternoon. I want to leave plenty of time to get my studying done so I can get to bed at a reasonable hour. The race doesn’t start till 9:00am, so I have plenty of time if I get up by 7am to eat breakfast and be out the door by 8:15am. That should put me at the race start early enough to do a quick warm-up and hit the bathroom before lining up. Last year, I think the race started a little late, but they’ve enlisted the help of Manhattan Running Company to do the timing this year, so I’m hoping we start right on time. As I mentioned, I’m not setting a goal time, but I expect to be done in around 30 minutes give or take depending on how congested the start is. After the race, I need to remember to stretch well so I’m not stiff/sore for Sunday. I might take a short nap before getting packed and ready to head out to Lawrence, KS for the night. We’ll pick up a few of our teammates and head to Lawrence around 5pm to all have dinner around 7 or 7:30pm and a brief race meeting. Then it’s early to bed for a really early wake up call. This will be my first attempt at running two races in one weekend. The overall mileage is pretty reasonable, so I’m not too worried about the physical challenge. I do think this weekend is going to be just a little mentally exhausting, especially since I’m going to try and fit in studying anytime I have some downtime! Have you ever done a relay race? Running a marathon is something I’ve had in the back of my mind for a long time. Training for a marathon during vet school is not something that’s been on my radar, but after a little push from an email today, I’m seriously considering the possibility for the fall. My schedule looks like it will allow the extra time for training and long runs. The race that I’m considering is an easy direct flight for a weekend trip. My training partner even said she might be interested in joining me. All the factors seem to be lining up for me to do this race. I just have a few more items to resolve before I make the decision. It has been nearly a year since my last blog post. Wow. Time certainly does fly. School keeps me incredibly busy, but I am still running pretty consistently. 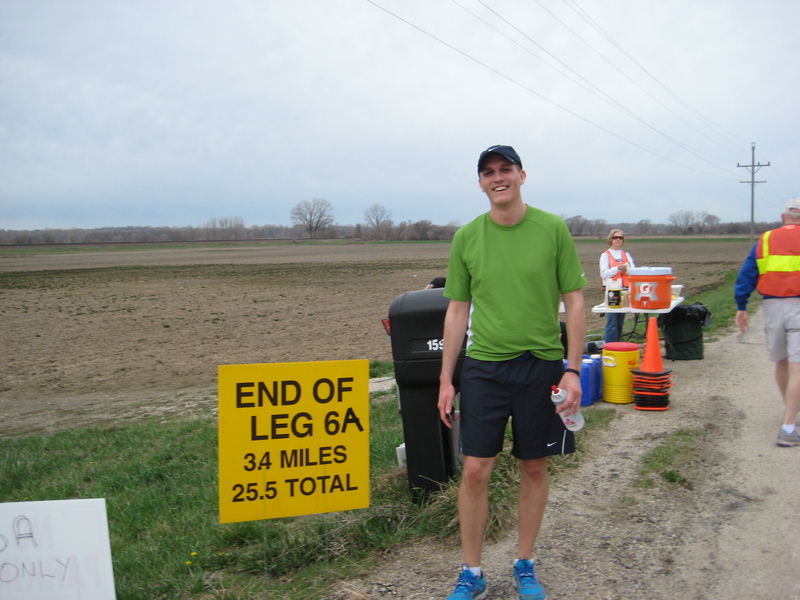 I ran another half marathon in the fall, and I have several running races fast approaching this spring. The triathlon bug has bitten once again, so I’m thinking about signing up for a race or two this summer as long as the scheduling works. The next race I have is Dog-N-Jog 5K/10K on April 6. 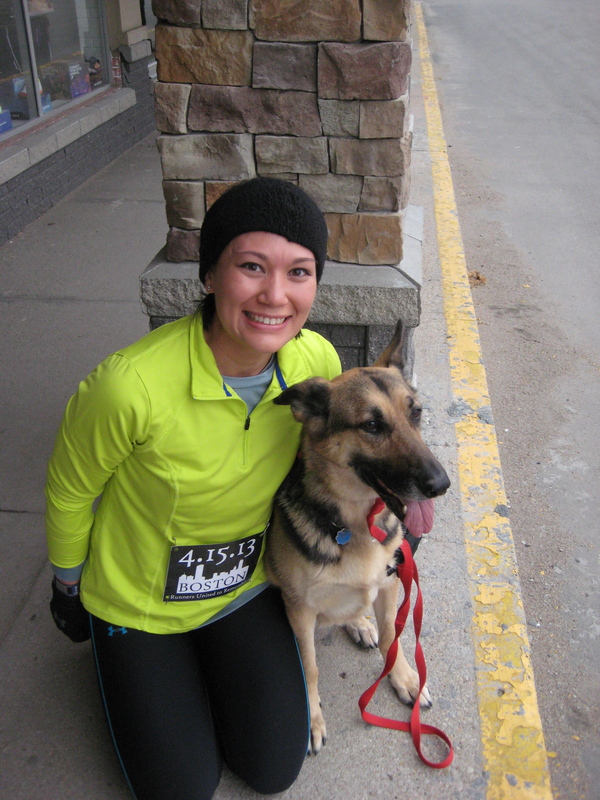 This is the same race I did last year with my German Shepherd Dog, Tara. I’m leaning toward doing the 5K again this year instead of the 10K. The 5K course is being altered a bit so that it is closer to the correct distance, as last year it was a little short at only about 3 miles exactly. 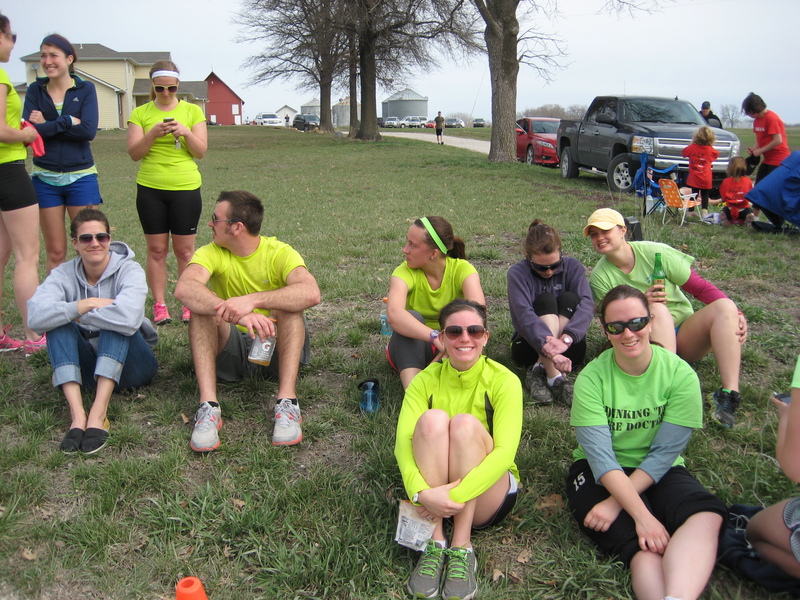 The next day, April 7, I’ve organized two teams for Brew to Brew, which is a 44 mile point-to-point relay race from Kansas City, MO to Lawrence, KS. We had two teams last year and it was a blast, so I’m really looking forward to doing this race again. I’ll be running two legs for a total of 8.8 miles. It will be a good warm-up for my next half marathon on April 21, the Kansas Half Marathon, which is the same race I did last spring. In other news, I’ve been trying a more Primal-style nutrition plan in my daily life. I started a 30 day self-challenge on February 27, so I’m over half-way through. I will freely admit that I am pretty lenient in the dairy department, and usually eat one serving of dairy per day. I have had a few servings of indulgences, but not many overall and none in the first two weeks of the challenge. The biggest benefit so far is that I’m not as hungry all the time and between meals as I used to be. I also lost about 8 pounds within the first week. I’ve since evened out at about 5 pounds lighter than my starting weight. Since I was already happy with my weight, I’m glad the weight loss has stopped. The only downsides are the meal planning and the expense. It’s a lot more expensive to eat so many fresh veggies all the time, but I do think it’s healthier to eat more fruits and veggies. Meal planning does take a little more time than a more conventional diet, but I don’t think it’s prohibitive. I usually plan meals for the week on the weekend and do all my grocery shopping over the weekend. One other observation I made was that initially, I felt extremely thirsty all the time, but that’s no longer the case. I will not pretend that I will be able to post on a regular basis over the next few months, but just wanted to jump in and do a quick update while I have some time. I hope to at least write some race reports for the upcoming races, but life may have other plans.